edited by Arthur Benz and Jörg Broschek. Oxford: Oxford University Press, 2013. 388 pages. Hardcover $110.00. ISBN: 9780199652990. Reviewed by James A. Gardner, SUNY Buffalo Law School, The State University of New York. E-mail: jgard [at] buffalo.edu. The invention of the telescope forever altered human understanding of the heavens. Long perceived as a harmonious, stately, and unchanging manifestation of permanent natural design, the universe was revealed by the telescope to be exactly the opposite – a frothing, complex arena of constant and indeed mind-numbingly violent change. Stars are born continuously in galactic furnaces; they do not merely orbit but consume one another. Black holes gobble up entire galaxies. Planets get torn apart by tidal forces of gravitation. Over the last few decades, our understanding of federalism has undergone a similar revolution. Long viewed as a simple, harmonious, and static arrangement of governmental power, federalism is increasingly understood as a highly complex system in permanent and sometimes violent motion. The components of federal systems, it turns out, frequently struggle against one another, sometimes bitterly, in a constant competition for power and advantage. Far from peacefully accepting constitutional limits on their powers, component units of federal states often seek to expand their authority, attacking and retreating, staking claims, and strategically opposing or interfering with the authority and actions of other components. If federal systems endure, it is not because initial endowments of constitutional authority produce a universally acceptable and mutually respected stasis, but because the process of intergovernmental contestation somehow produces a long-term, sustainable, yet constantly moving equilibrium. 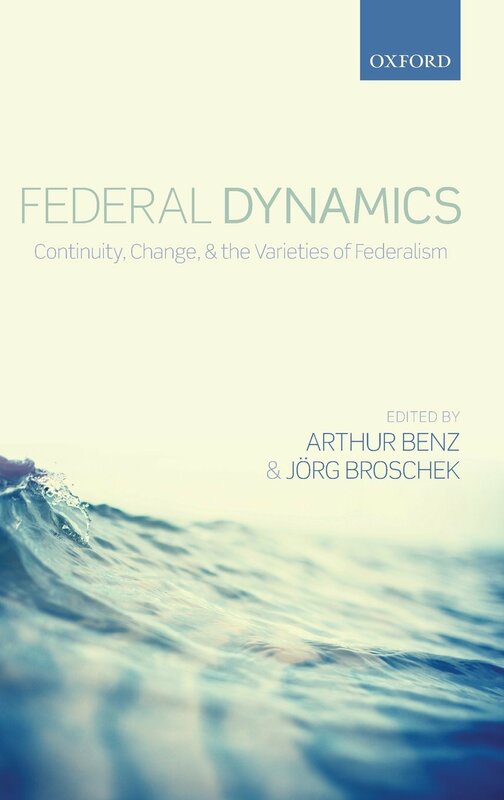 The editors of the present volume have thus chosen an apt subject: “federal dynamics.” The volume, a collection of seventeen chapters written by more than twenty authors, begins from the premise that federalism is a dynamic rather than a static system, and it seeks to explore in depth the ways in which such systems operate. In particular, the editors explain, the volume aims to illuminate three big questions: “What changes within federal systems? Why do federal systems change in a particular way? How does change materialize and develop?” (p.3). To this end, the editors intend the volume to identify and unpack the sources and mechanisms of change in federal regimes and the patterns according to which such change occurs (pp.8-16). One difficulty this project faces is that it greatly complicates the idea of what it might mean for a federal system to “change.” According to the old, static model, the parameters of federal systems were considered fixed: a constitution allocated powers among different levels of government, established institutions [*187] of intergovernmental relations, and created enforcement mechanisms – a constitutional court, for example – to ensure that the actors inhabiting the system stuck to the plan. On this view, “change” could occur only, or at least primarily, through formal amendment to the constitutional template. Deviations from the plan, no matter how significant or ubiquitous, were considered just that – deviations subject to eventual correction by enforcement mechanisms that either were or were not adequate to maintain the structure dictated by the constitutional design. If, however, federalism is reconceived as a dynamic system whose normal state is one of virtually constant motion, then the categories of things that count as “change” expand considerably. First and foremost, de facto alterations in the allocation of governmental power now count not as deviations from, but as changes to the constitutional plan. Accordingly, when a component of a federal state begins to exercise power in a field previously understood to be the domain of other components – a province begins to conduct foreign relations, for example, or a national government begins to influence the structure of provincial government – this is understood not as an unconstitutional encroachment on powers assigned to other levels, nor as a temporary deviation from an established plan, but as movement of the federal equilibrium point. Similarly, when functions by design assigned to one institution – a senate, for example – come to be performed by a different institution – national political parties, say – this too is conceived not as a deviation from or accommodation within an existing design template but as a change to the template itself. The advantages to this way of looking at things are obvious. It is a more capacious view that renders visible many phenomena that the old framework obscured. It is more realistic. It more accurately reflects the complexity of intergovernmental relations in federal systems. But there are costs as well. Once the definition of “change” is thus expanded, the number of things that suddenly become capable of precipitating change explodes. For example, an extraconstitutional reallocation of governmental authority might result from deliberate intergovernmental negotiation outside of formal processes of constitutional amendment; or it might be the inadvertent result of a series of improvised responses by governments to unforeseen economic or political conditions; or it might result simply from unconscious evolution in ground-level practices of governance and administration. Yet all these developments, under the dynamic model, count as agents of change to the federal system. Moreover, any attempt to take seriously the volume’s asserted goal of explaining what changes in federal systems, and why and how those changes occur, must deal with a potentially limitless number of variables – variables that previously were counted not as part of a federal system but as features of the changing landscapes on which federal systems of governance sit. Several of the volume’s authors acknowledge – and eagerly take on board – this complexity by breaking down the idea of a federal system into numerous components. Federalism, Benz and Broschek claim in their [*188] introduction to the volume, is not only an “institutional arena” of divided powers (p.4), but also a “multilayered regime” comprised of “social cleavages, formal or informal rules, power relations, normative ideas or interpretive frames, and, ultimately, constellations of actors” (p.5). It is “an expression of deeper conflicts rooted in society”; a set of “formal institutions and informal routines that establish authority relationships”; a set of “normative or ideational constructs that actors employ in order to interpret their social and political environment”; and “a constellation of political actors” (pp.5-6). In a chapter on the “varieties of federalism and their propensities for change” (Ch. 3), César Colino sets out a multi-factor account that categorizes federal systems according to their “interaction styles,” “the type of actors’ strategies,” and “the type of intergovernmental conflict lines and coalitions” (p.56). In a later chapter, Benz focuses on the influence on federal systems of factors such as “social change” (p.78), “mobility” (p.79), and “changes in loyalties” (p.79). Broschek writes of the significance of the precise sequence in which historical events occur (Ch. 5). Daniel Béland and André Lecours focus on the role of popular sentiments of nationalism in influencing evolution of the federal structure (Ch. 10). It is clear from this quick sampling that the radically open texture of the dynamic model drastically complicates the study of the target phenomenon. Indeed, some of the chapter authors seem to suggest – accurately, no doubt – that virtually any conceivable social, economic, or political development is capable of setting off a chain of events that might ultimately cause some alteration to the allocation of governmental power in a federal state, or confer unexpectedly on some governmental actor a benefit or detriment that could lead to movement of a federal system’s equilibrium point. As a result, an important – though I suspect unintended – cleavage laid bare by the volume is methodological. The most successful chapters are those in which the authors restrict the variables to a manageable number by focusing on specific cases, working with clearly defined hypotheses, and confining themselves to drawing limited, defensible inferences from good evidence. Kathleen Thelen and Sebastian Karcher, for example, have written an excellent chapter invoking the idea of incremental evolution to explain the resilience of the German Bundesrat through periods of historical upheaval (Ch. 6). A chapter by Mikhail Filippov and Olga Shvertsova makes the intriguing and cogent argument that it is easier to improve the quality of democracy in a unitary than in a federal state even though all successful multiethnic democracies are federal, suggesting that democratizing states face a tradeoff over the kinds of institutions they may most successfully develop in the short term (Ch. 8). Lori Thorlakson’s interesting chapter focuses on the ways in which party structure and competition can reinforce or undermine federalism’s territorial cleavages (Ch. 11). Conversely, the least successful chapters are those in which the authors bypass individual cases in favor of much more ambitious and highly abstract theorizing. The goal in these chapters seems to be to advance the project of understanding the [*189] dynamics of federalism solely in the theoretical dimension by deriving analytic frameworks from logic or first principles alone. The immense range of potential variables, however, makes this in many cases an arid and unsatisfying enterprise. It is one thing, for example, to make the concrete interpretational claim that a specific historical event or the rise of a specific form of regional identity was an important influence on the structure of federalism in a particular state. But it is quite another to make the abstract claim that “critical [historical] junctures” (p.95) or “ideational processes” (p.209) are variables that must be included in any comprehensive account of how federal systems evolve or why particular polities become unitary while others become federal (p.94). Indeed, these propositions are so abstract that they are tautologically true – yes, history matters; yes, ideas matter – and not just for federalism but for every form of human governance and organization. It is unclear, as a result, what makes these constructs models of federalism specifically as opposed to universal models of human behavior within political organizations. The potential relevance of this enormous number of variables is perhaps a useful fact for analysts to tuck away when approaching particular cases or comparisons, and if this is all the volume’s editors and contributors have in mind, then their warning is well taken indeed – students of federalism are well advised to look all around them when examining particular cases. To the extent the volume aims higher, though, I am not convinced that the proponents of these models and frameworks have successfully explained what work they are capable of doing. Models by definition simplify; that is their purpose. Yet there are, by the most generous count, no more than about 25 federal states in the world, and by some counts the number is lower, around a dozen or so. Students of federalism thus have the unusual advantage of being able actually to know the individual cases in some depth. It is thus unclear to me what might be gained by substituting for an actual, nuanced knowledge of the history and contextual evolution of particular federal states a deliberately simplified, modeled form of understanding that apparently would proceed by remanding the nuances of local history, social conflict, or nationalist ideology to the opaque interior of a black box. Would this not flatten rather than enhance our understanding of these interesting objects? Perhaps a case can be made for the latter, but if so, the authors’ very commendable enthusiasm for the project seems, at least to this reader, to have outrun their communication of its benefits. FEDERAL DYNAMICS: CONTINUITY, CHANGE, AND THE VARIETIES OF FEDERALISM is likely to be of interest to scholars who study federalism. It will be of particular interest to those curious about theoretical accounts of the evolution and development of federal systems.